On the Sunday afternoon when Tropical Storm Irene began to drench Vermont, Sandy Lincoln was in her usual spot: the kitchen of her café, Sandy’s Books & Bakery, on North Main Street in Rochester. She watched as the rains became progressively heavier and the streets and café “very, very quiet.” Then she sent her employee Rhianna Graham-Frock home for the day. When Lincoln left a little while later, washed-out culverts prevented her and her husband, Larry Plesent, from getting to their home in the hills above town. That’s when Lincoln saw the “engorged” Brook Street brook pounding away at Graham-Frock’s house, which would eventually collapse. A panic gripped her — had she sent the high schooler home to certain harm? The couple decamped to a friend’s house and waited for the waters to subside. There Lincoln discovered, to her immense relief, that Graham-Frock and her family had evacuated their home. Later that night, she and her husband set out again, wading home through high water. Along the way, the bedraggled pair spotted some oyster mushrooms growing on an old log and harvested them. That night, they dined on the wild mushrooms with butter, salt and pepper, and brown rice. “It made us feel better,” says Lincoln. The next day, she and Plesent hiked a mile from their house to their truck, then drove to town on an intact road. They found Rochester without power, phone service, water or any link to the outside world, and friends whose houses had been swept away or severely damaged. By the time Irene retreated, this village nestled between mountains was one of Vermont’s isolated towns, its residents marooned without a means of egress. What they did have those first few days was each other. And they had Sandy’s. Lincoln opened her café the day after the storm, making it one of a few islands of normalcy in a vastly altered landscape. As they began to deal with the damage, some residents trekked around washed-out roads and wended through woods to the center of the village, where they found Lincoln in her café. “People would arrive over the course of days, just sort of shell-shocked. They’d hike out of the woods to tears and hugs,” says Lincoln, a blonde, nurturing figure with warm blue eyes and a face that looks younger than her 54 years. Lincoln has been selling new and used books for a decade from her lime-and-lemon-hued Victorian. Originally from Pennsylvania, she met her husband in Vermont and moved back to his hometown of Rochester. The longtime bibliophile was the town librarian before leasing the house on North Main Street and turning it into Seasoned Books. Lincoln, who also loves to garden and cook, would sometimes whip up humongous pots of soup at home, or grow and sell produce. Six years ago, she added a café at the back of her bookstore, installing a kitchen, a wooden counter, and mismatched tables and chairs amid the shelves. Lincoln fills that counter with house-baked breads, scones, muffins and oversized cookies. 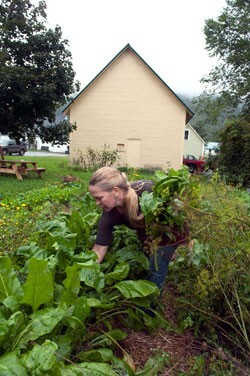 At lunchtime, she offers fresh soups, sandwiches and savory pies crafted from the produce of local farms and food purveyors, as well as from her own sprawling garden out back. In good times as in bad, Sandy’s is a gathering spot for locals and the legions of cyclists and tourists who pass on Route 100. Customers greet each other warmly; servers sometimes know what they want without needing to ask. While some customers strike up conversations, others lose themselves in books. The shelves full of volumes muffle noise, lending the rooms a hush that’s especially enveloping on rainy or snowy days. During Irene’s aftermath, the café became a more vital hub than ever before. Mirroring its physical counterpart, the eatery’s Facebook page became a clearinghouse, too. It displayed daily, sometimes hourly, updates from employee Ruthellen Weston, who was stuck in Rutland. “Is everyone OK over there?” was Weston’s first post after the storm, at 9:45 p.m. on August 28. From the six comments that followed — from people outside Rochester — it became clear that all routes into town were impassable. After Lincoln opened her café on Monday morning, neighbors slowly began to trickle in. She had things they could use: an old, working rotary phone; water; and — after her husband brought in one of their generators — the ability to bake and cook. Lincoln made soup and lots of it: split pea and ham with fresh basil and carrots; four-bean vegetarian chili with sun-dried tomatoes; her signature African peanut chicken soup with eggplant, fresh basil, cinnamon, cumin and cayenne pepper; and roasted-tomato-and-garlic soup with “the last of our Strafford organic cream.” Plesent carted these soups to neighbors all over town — along with loaves of fresh bread — as he helped muck out houses and move downed trees. Those who came to the café shared their flood stories, then sometimes paired up and left to tackle tasks together. And, of course, they ate. “I think Rochester was pretty well fed that first week,” Lincoln says. On the Facebook page, Weston continued to report potential deliveries of food and water and passages into Rochester. Visitors to the page wondered about neighbors, family and friends. Sandy’s has also returned to quasi-normalcy. Food deliveries are increasing. From points north, drivers can take Route 100 almost all the way to Rochester, though a detour around Granville diverts travelers up North Hollow Road. Wong, who retired to Rochester after a career in the forest service, recalls his own Irene experience. When he first ventured into town from his home on the outskirts, two days after the storm, a neighbor told him to go register at the town office. “You’re missing,” the neighbor deadpanned. When Wong realized he’d been missed during his two days incommunicado, he was touched at how this close-knit community had kept track of him, a single man among hundreds of victims. Bantering with Wong in the café, Lincoln says that, though things are returning to normal, everyone in Rochester will remember this time for the rest of their lives. “You’ll think, Oh, it’s a gorgeous day; it’s really beautiful out. Then you’ll drive past the ‘hanging house,’” she says, referring to a ruined house on the edge of town. Such reminders of disaster may be hard to escape, but other Rochester landmarks, such as Sandy’s itself, will awaken better memories — of a town that stuck together in the storm. Finished chatting, Lincoln offers a visitor a complimentary “gorp” — a chunky cookie filled with oatmeal and dark chocolate chips. Then she disappears into the kitchen to keep on cooking. 6 to 8 stalks celery, leaves and all, diced? 3 to 4 large carrots, peeled and diced? 1 large eggplant, peeled and diced? 1 gallon chicken broth (or vegetable stock)? Rinse chicken pieces, then parboil in a heavy stock pot with a bundle of thyme leaves. Remove chicken, let cool, then chop coarsely or shred. Place a large, heavy soup pot over medium heat. Heat the oil and butter, then add celery, onions and carrots and cook until softened. Add eggplant, tossing in with the other vegetables until it begins to get tender. Add tomatoes, tomato paste, peanut butter, herbs and spices, and chicken or vegetable stock. Once the soup is coming together, add the chicken and simmer gently for another 20 minutes. Add tamari toward the end, and salt and black pepper to taste. Enjoy!